Language is a crazy thing. We string random words together that don't make any sense, but because we understand the idiom, we give no second thought to saying something like "Don't do that, you'll just open a can of worms." I'm having a great time in my office teaching some of the local staff these phrases. In fact, sometimes I even try to add them to our conversations just to have a bit of a laugh together. "I'll get to that in the drop of a hat." or "You just hit the nail on the head." We discuss the meaning, then throughout the day the girls will try it on me a few times, I google the definition and send it to them with a cute clip art to give a visual clue. We have great fun with this. In return, they explain Chinese sayings to me and play on words in their language and culture. The Lunar New Year is probably the most important holiday in Taiwan and food is an important part of the festivities. Certain foods are given as gifts simply because of the way the name sounds. For example, the word for the fruit persimmon is pronounced shi in Mandarin which suggests the expression shi shi ru yi (may everything happen as you wish). Rice cakes are popular, especially one called fa gao. Fa means to make plenty of money. Giving these treats wishes good luck on those you bestow them to. It's also easy to think that because I speak English, I will understand the language in other English speaking countries. When moved to New Zealand, we quickly learned that English was different all over the world. We would giggle as we said we were wearing our jandals (flip flops) and togs (swimsuits) to the bach (beach house). When we first arrived, we had no idea what that sentence even meant! Languages have layers and hidden meanings and sometimes you have to understand more than just individual words on a page to be able to get the rich meaning of a story. This is one of the things I love about studying the Bible. There are the black and white words right in front of me that I can read and understand. The book of Ruth tells a story. It's simple, about a woman and a girl and a man. When I read this book in the context of the other 65 books in the Bible, I discover another layer that tells a greater story about the redemption of God. Then as I dig deep, I begin to uncover little pearls and gems hidden within the text. Today my discovery is one of those pearls. This idea that Naomi sent Ruth to Boaz in the dark of night, told her to wait until he had drank his fill of wine, and then to approach him and lay down at his feet sounds risqué and crazy. In fact, it was. But in all my searching, I did not find any source that accused Boaz and Ruth of being impure. Quite the opposite, this daring act forced Boaz to protect Ruth and her reputation. I took some time to read the chapter in the Message translation. I actually didn't like the way the story went. If felt a bit unfamiliar and unsettling so I set it aside and began to dig into a few verses. When I came to verse 9, I was taken by surprise. 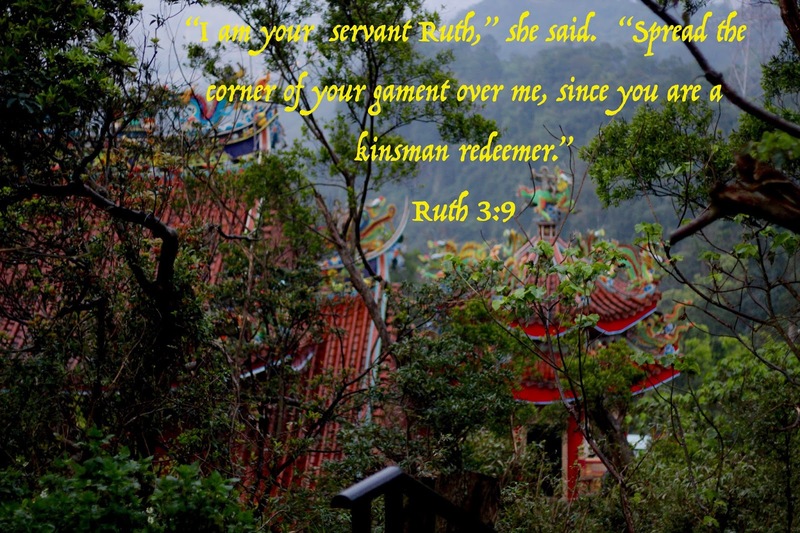 This little scene that I am so familiar with "Spread the corner of your garment over me..." is much deeper than just Ruth being a bit chilly and wanting Boaz to lay his coat on her. The Message says "Take me under your protecting wing." Wow, that's different! My mind was jolted to 2:12 because our group found it so beautiful that Boaz blessed Ruth by saying "May you be richly rewarded by the LORD, the God of Israel, under whose wings you have come to take refuge." The same Hebrew word is used in both these verses. Kanaph is translated so many different ways: corner of your garment (NIV); corner of your covering (NLT); your covering (NASB); spread therefore thy skirt (KJV); spread your cloak (HCSB); marry your servant (NET); edge of thy mantle (Jubilee); spread thy coverlet (Douai-Rheims). Do you see how confusing this can become? In fact, only the Message and the ESV translations used the word wings in vrs. 9. The exact, precise meaning of the word Kanaph is wing or extremity. How cool is this? I think we have a little romantic banter going on here. Boaz asked God to spread His wings over Ruth and she replied, "How about you spread your wings over me?" Ruth was asking him to protect her. This is where studying the Bible gets fun. The phrase "to spread his wings" also means to spread the outer four-fringed garment over her as is still done in Jewish wedding ceremonies today. This whole exchange was bold and daring as well as fun and playful. It makes me fall in love with the story of Ruth all over again.